I bought 4 of the lipsticks for $24 in total so it worked out to be $6 each. The Kate Moss lipsticks retail for $11.95 each and the normal lipstick is $9.95. I bought 2 of the same ones. I bought two of the 16's as they had run out of 05 and nothing else caught my eye. I might try to exchange it at my local Priceline store. Asian and 19 are very similar although Asian is a tad darker. 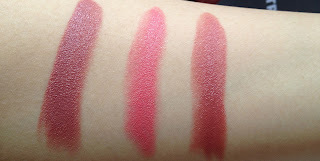 I haven't taken great photos of the swatches but all three lipsticks are pink-er in real life and a lot brighter. I'll do a review of them on my lips later if anyone wants it. All 3 are super creamy and pigmented. I've read lots of reviews that they last about 2-3 hours. On a totally unrelated note, I received my $30 gift voucher from Country Road today for reaching loyalty status! I absolutely love Country Road but I never buy it unless it's on sale. To reach loyalty status, you have to spend over $750 in 12 months. I love Country Road and rarely ever shop for clothing any where else. 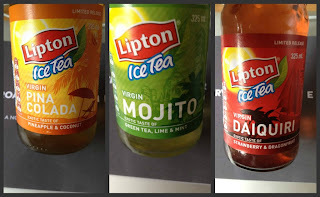 On my way home today, I also bought these bottles of Lipton iced tea :) They're limited edition and have been out for about 2 weeks. Don't forget to enter my giveaway! http://shoppingqueenjen.blogspot.com.au/2012/10/50-followers-giveaway.html and I have a new post coming up tomorrow! You really are a serial shopper, arent you!!! But good deal with the Kate Moss Lipsticks! And I love Country Road shopping....in fact, just had an online order delivered yesterday! Love the look of no.16. Can't wait for the reviews. no.16 is gorgeous in real life! It's much much brighter and a bit like baby pink on the lips. I never thought I'd go for that sort of lipstick but I LOVE it. I walked straight past those lipsticks today, can't be breaking my spending ban! It's totally worth breaking your ban if its buy one, get one free! I love the Kate Moss lipstick range. 16 is so pretty for Spring. I have to get my hands on a Mojito iced tea now! Yessss I love this lipsticks as i said in my previous comment haha! They go on so smooth and do last for ages. I was thinking about heading down to Priceline tomorrow and you've just confirmed it for me! Priceline have an amazing catalogue! They also have $7 off max factor so a lot of the range is more than 50% off! Ooh I must get my hands on the Rimmel deal! The lipsticks look gorgeous :) The ice tea looks so nice too! I have been eyeing these for a while but I heard they are a bit drying? I have some flaking on my lips :S I would love to see a review with lip swatches! I've been obsessed with 16 since I bought it today and it is a tad drying. They look amazing with a lip gloss over them but they get messy with a lip balm. I forgot to add: Although they are a little drying, my lips are flaky and it didn't show at all. Great post! Following you now here on GFC :) Thanks for visiting my site, and I'm looking forward to more posts from you! I love the Kate Moss lippys! She has a matte collection now too which I'm in love with! I've just bought the Straberry Flavour Balmi but I might have to buy the coconut now too! Your blog is gorgeous, it looks lovely and is an interesting read. Please check mine out if you have time. I'm a newbie!